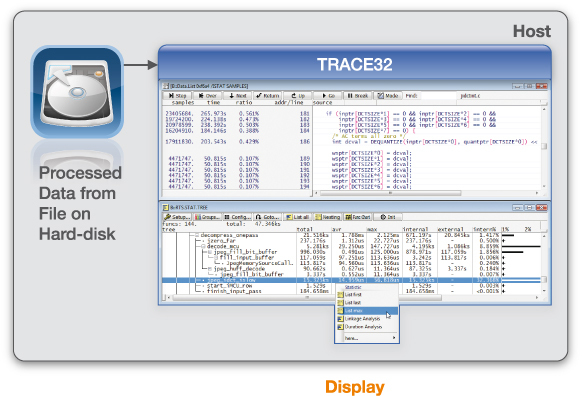 TRACE32 supports various trace sink options to provide the best possible monitoring of chip-internal processes. Chip internal processes include: the program execution on the individual cores, transfers on chip-internal buses, benchmarking, software-generated system information and more. (e.g. MPC55xx/MPC56xx with 8 entries, S12X/XGATE with 128 entries). (e.g. ARM ETB with up to 16 KBytes, TC27xED with 1 MBytes). The trace information generated is recorded into the on-chip trace buffer. The trace information from the on-chip buffer is uploaded to the host computer via the JTAG interface, analyzed and displayed. 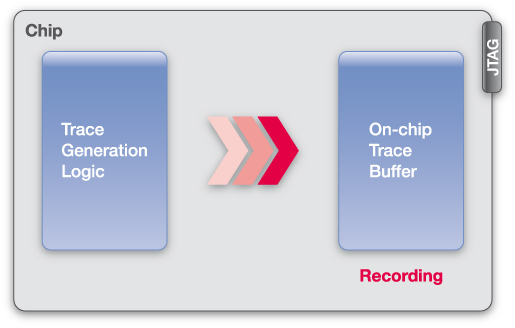 Uploading the trace information from the on-chip buffer is only possible if the recording is stopped. Many core designs provide a parallel or serial off-chip trace port (e.g. TPIU for ARM CoreSight, HSSTP for ARM cores, NEXUS Interface for some Power Architecture chips). 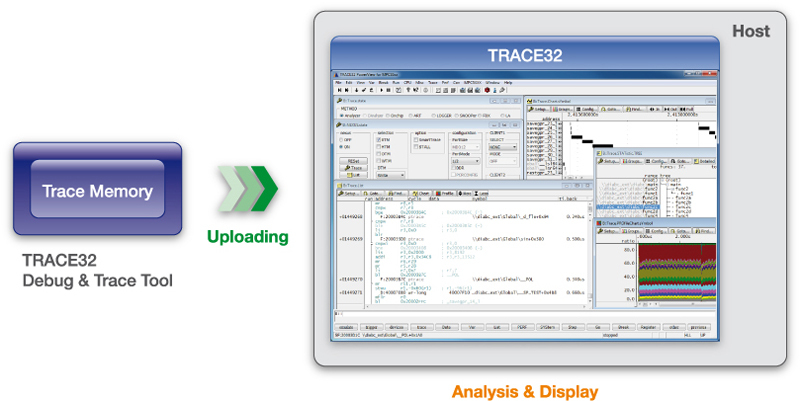 A TRACE32 Debug & Trace Tool has to be connected to the target in order to record the exported trace information. TRACE32 CombiProbe provides 128 MByte. TRACE32 PowerTrace provides up to 512 MByte. TRACE32 PowerTrace II provides up to 4 GByte. The trace information generated is sampled at the trace port pins and transferred into the trace memory of the TRACE32 Debug & Trace Tool. The trace information is uploaded from the trace memory to the host computer, analyzed and displayed. It is only possible to upload the trace information when the recording is stopped. Streaming, this means that the trace information is collected and buffered by the trace memory of the TRACE32 tool and immediately transferred to a file on the host computer. This procedure enables use of trace memory to up to a size of several T Frames. 64-bit host computer to handle the large trace record numbers. The average data rate at the trace port should not exceed the maximum transmission rate of the host interface in use. Peak loads at the trace port are intercepted by the TRACE32 Debug & Trace Tool, which can be considered to be operating as a large FIFO. Various mechanisms to compress the trace information before streaming are implemented. The trace information generated is sampled at the trace port pins and transferred into the trace memory of the TRACE32 Debug & Trace Tool. From there it is streamed immediately to a file on the host computer. The trace information is read from the streaming file, analyzed and displayed. Reading the trace information from the streaming file can only be done when the recording is stopped. As the streaming file contains only raw data to complete the analysis requires the target context at the recording time. Real-Time Profiling means that the streamed trace information is analyzed in real-time on the host computer. This procedure is mainly used for Code Coverage and Trace-based Profiling. As the trace information is analyzed immediately, the results can be inspected whilst recording continues. Real-Time Profiling provides a way to analyze a virtually infinite amount of trace information if the trace information is discarded after its analysis. Supported for ETMv3, PTM, CoreSight ETMv3, CoreSight PTM. The program execution of a single core or of multiple cores in an SMP system can be analyzed. Supported for software-generated trace information (CoreSight ITM, CoreSight STM) from multiple sources. The trace information from the individual sources can be redirected to its corresponding third-party analysis software through various mechanisms (e.g. named pipes). 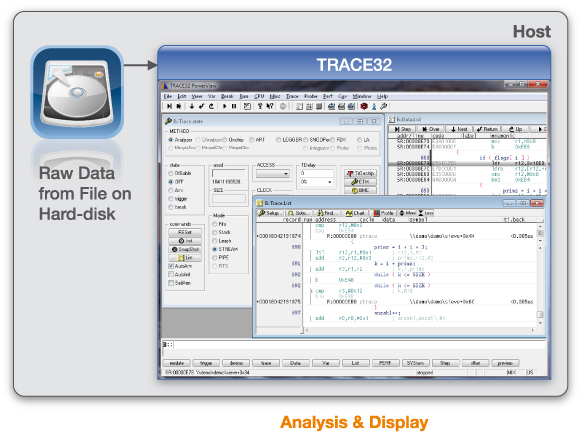 A TRACE32 Debug & Trace Tool that allows streaming of the trace information whilst recording; currently supported by the CombiProbe and PowerTrace II. The trace information generated is sampled at the trace port pins, placed into the trace memory of the TRACE32 Debug & Trace Tool and streamed immediately to the host computer. There it is analyzed and displayed in real-time. Instead of discarding the trace information after its analysis the processed trace information can be stored to a file on the host computer. A 64-bit host system is needed to handle large trace record numbers. The trace information generated is sampled at the trace port pins, placed into the trace memory of the TRACE32 Debug & Trace Tool and streamed immediately to the host computer. There it is analyzed and displayed in real-time. In parallel the processed trace information is copied to a file. In order to understand the analysis results in detail the trace information which has been processed can be read from the file back into TRACE32 at any time. The target context at the recording time is not required.